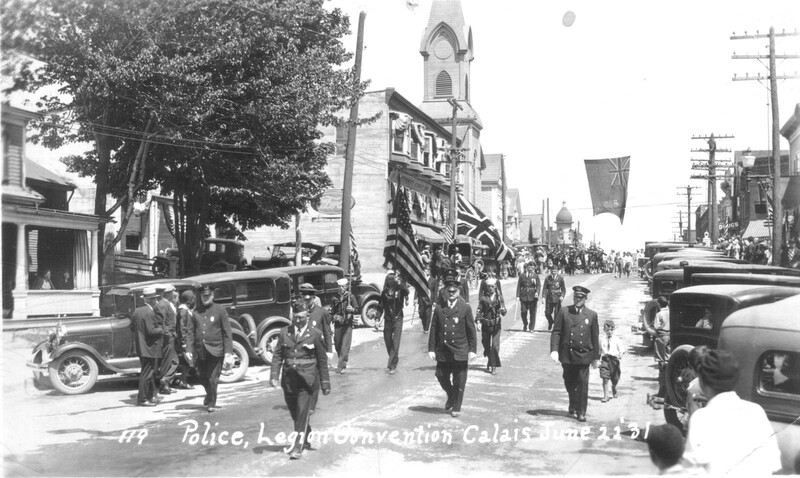 Calais and St. Stephen have seen many international parades, most to celebrate important annual national events such as Queen Victoria’s birthday or the Fourth of July. 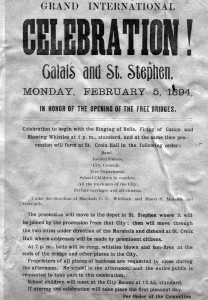 The largest ever was in February 1894 and it was purely local celebration. 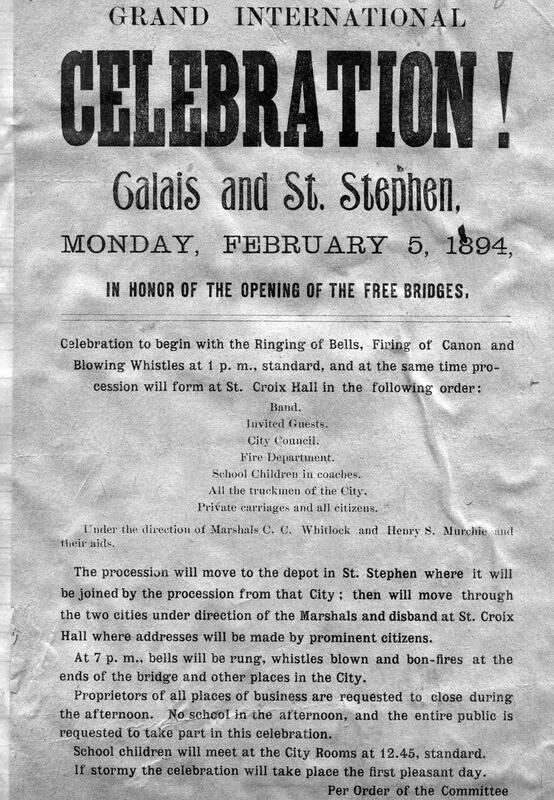 It marked a unique event- the day the toll bridges over the St. Croix at Ferry Point, Milltown and the Union became municipal bridges and free to everyone. 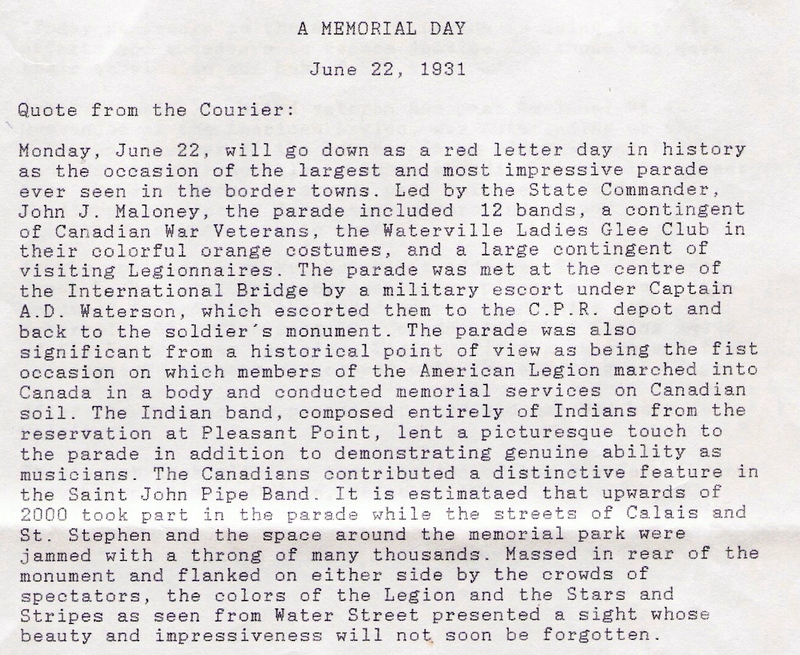 It is perhaps hard for us today to imagine what a feeling of liberation swept the St. Croix Valley. 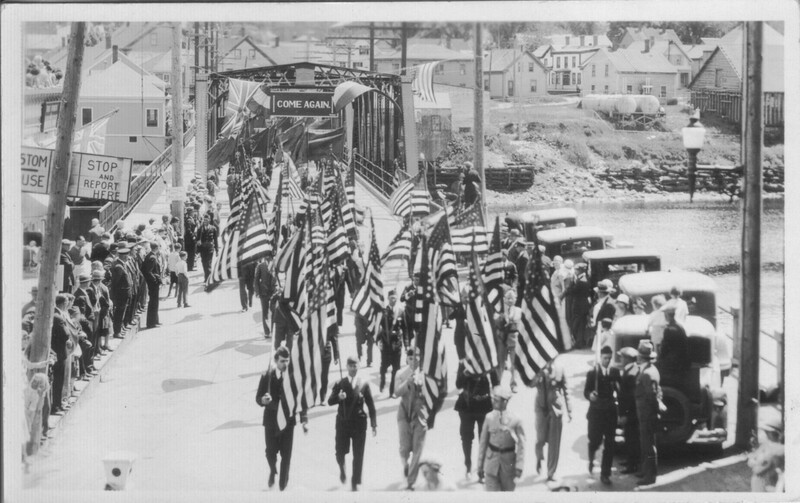 Newspaper reports recount that many thousands of citizens who previously had been forced to pay to use any of the bridges, walked the 5 mile “loop” free on this cold February day up North Street from Calais to Milltown Maine, across the bridge to Milltown NB and back down the river to St. Stephen and back across the bridge to Calais. 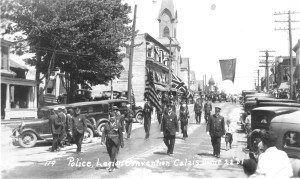 The second largest parade in our history may have occurred in the summer of 1931 when the Legion held its State convention here in Calais. 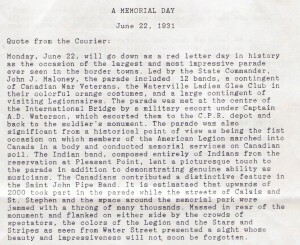 Thousand participated in the parade and many thousands more lined the parade route on both sides of the border. 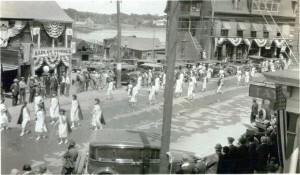 The parade came down Main Street from the park and in this photo is passing the corner of Main Street and Hog Alley. The library is just behind Sadler Coal. 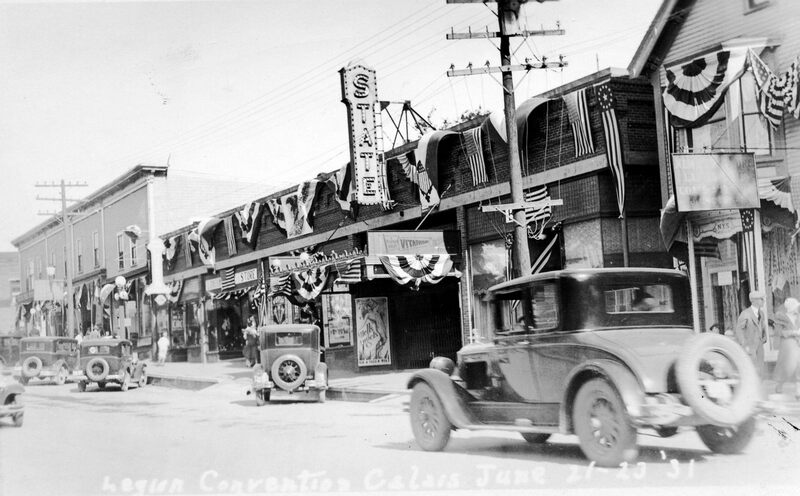 The Cole Bridges building, which is still standing, can be seen to the right although it looks much different these day from being rebuilt after three major fires. Today the site of Sadler Coal is the apex of the triangle of Triangle Park. In this photo the Indian Band from Pleasant Point is performing. 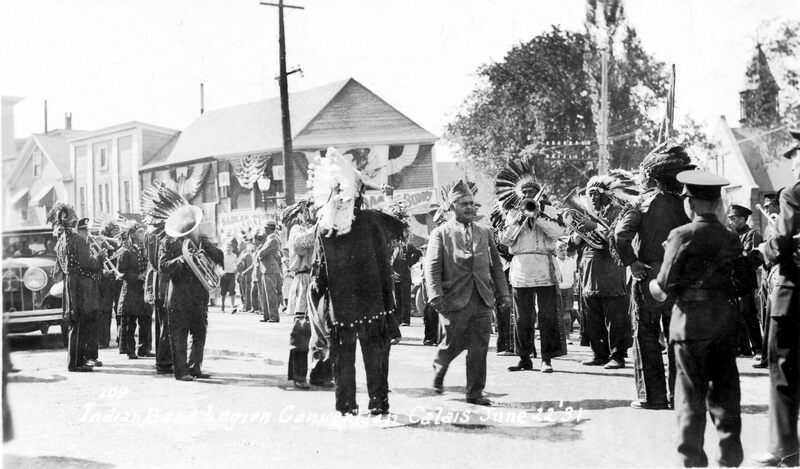 The Passamaquoddy bands of those days were highly regarded and no parade was complete without their colorful regalia and musical talent. The library can be seen to the far right. Police officer on left is Bobby Kerr, next to him is Howard Eye. 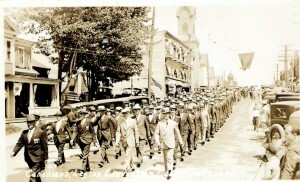 In this photo the parade is in front of the St Croix Hotel. The very corner to the hotel can just be seen to the left. The police officer on left is Bobby Kerr, next to him is Howard Eye. 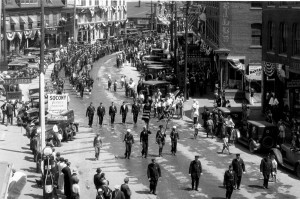 To the right is Sawyer Avenue and the corner now occupied by Karen’s pub at the end of the large brick block now owned by Tex. In 1931 Taylor’s Hardware occupied the Karen’s Pub location and Todd’s Hardware was next door. On the other side of the street and to the left rear are the Emmans Hotel, later the JD Thomas garage, and the Hill Pike bock which became Cole Bridges. The parade continued down Main Street toward the bridge. 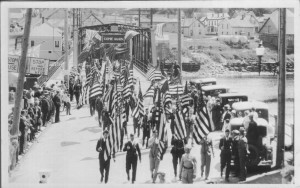 Here the legionnaires and police are marching in front of the Goode The parade is coming across the bridge into St Stephen. 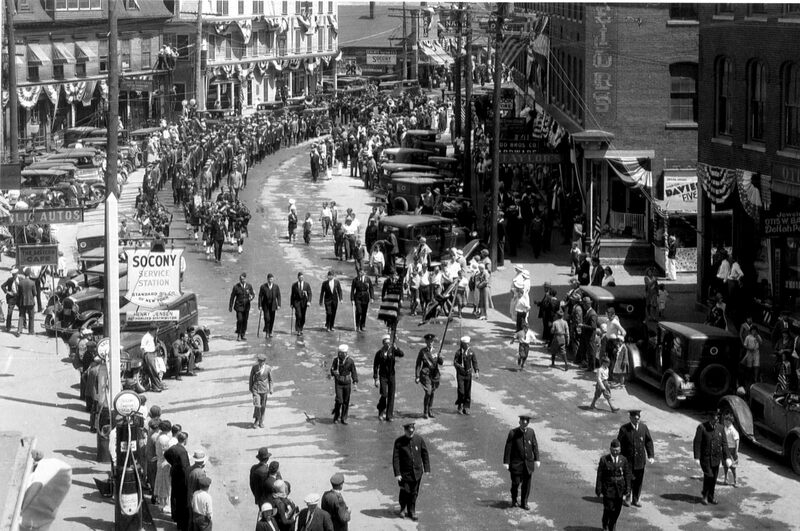 To the left on the U.S. side can be seen the Customs House, only in 1935 was the present Customs built on the other side of Main Street. On the right is River Street in Calais and the site of the gas plant which was removed to build Customs. 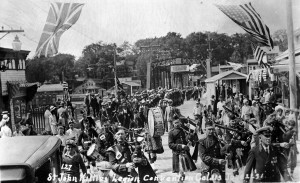 Returning back across the bridge to the U.S. the St John bagpipers pass in front of the U.S. Customs on the right and a wooden block on the left which in those days was the site of the Olympia Ice Cream Parlor, the Grant Anderson clothing store and a currency exchange. 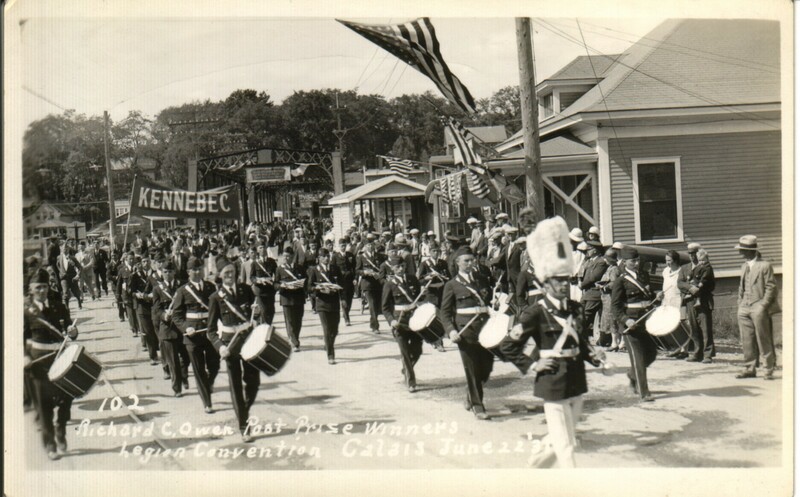 In the second photo another band After all the marching we’re sure many Legionnaires relaxed by taking in a movie at the State Theatre. Playing was Hell’s Angels a classic war movie in which Jean Harlow made her debut in a role which was condemn by some as much too provocative. 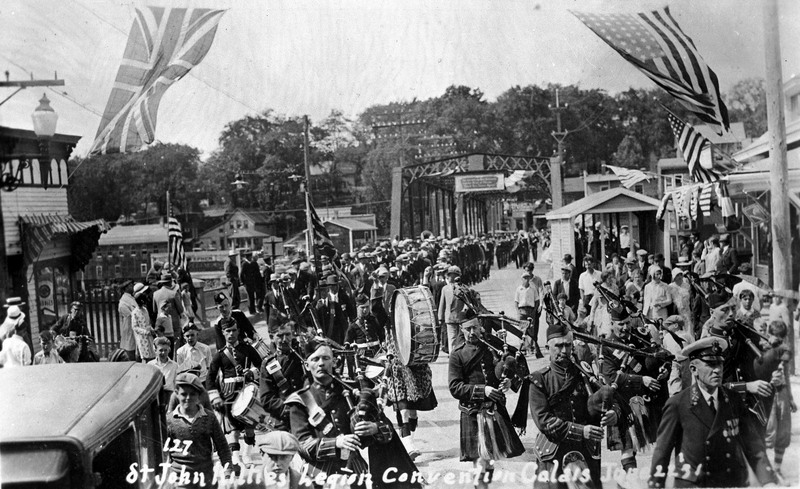 The movie contains many scenes of actual aerial combat over France in the WW1 and is still considered one of best movies of the era.leads the legionnaires from Kennebec County back into the United States.House, recently the Tow While the convention was a great success there was much that was going wrong in the United States in 1931. 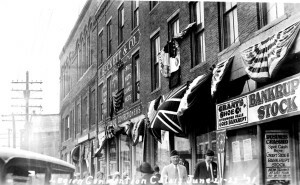 Grant’s Shoe store, next to Beckett’s was going bankrupt and other businesses in Calais would soon follow as the depression deepened. The Calais Bank on the corner was one of these and many in Calais lost everything. 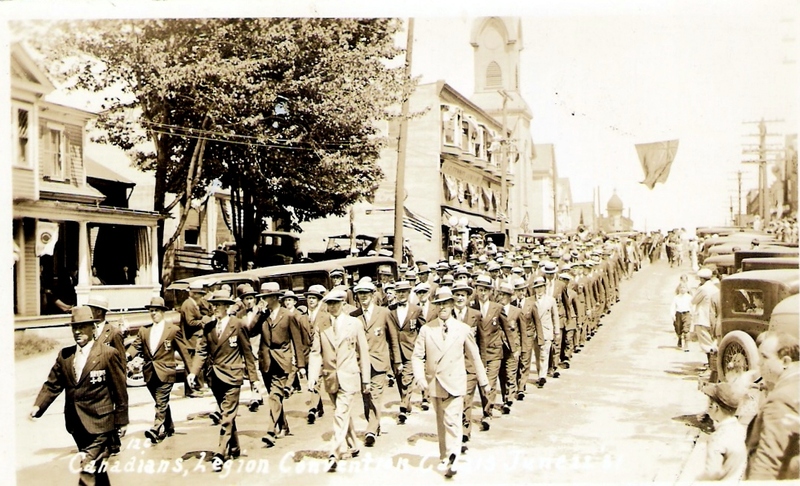 In the background is the block which was once JC Penney and later Johnson’s Hardware. 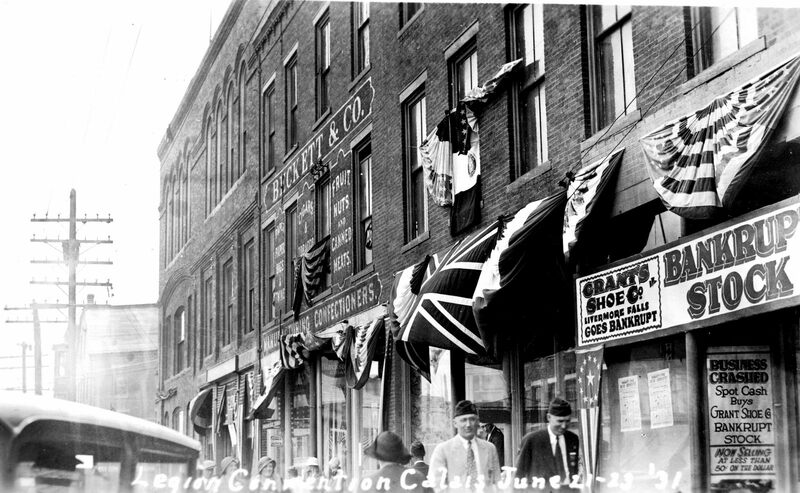 Note the Union Jack hanging at the intersection of Main and Monroe streets, a symbol of our international character.